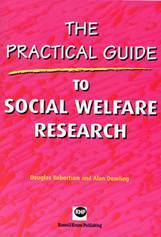 Research affects every aspect of work within social welfare services. This includes evaluating performance, undertaking service audits, assessing needs, and enabling service users to be consulted and involved. Providers and users should also be actively invited to look at the implications of research reports and studies. Given that policy makers, managers, fieldworkers, trainers and students have to engage with a wide variety of research outputs, it is crucial they fully understand how research is commissioned and undertaken. To guide you through the Research process, the book divides into three distinct but related sections. The first of these, Planning the project, takes you through the entire planning process. Whether undertaking the study yourself, or commissioning the work, it is crucial that you understand and appreciate the issues that arise at the various planning stages. Putting a project together provides a comprehensive review of the different methods that can be applied to answer your particular research questions. The final section, Finishing off the project, covers the critical data evaluation and analysis stages, stressing the importance of theorising. This section concludes by looking at the various ways the resulting study can be presented. Throughout, the book offers practical advice, worked examples and clearly structured information on the entire research process. Hopefully this book will improve your ability to both undertake and evaluate the worth of research in whatever area of social research you are involved with.